The event builds on the success of CCRA’s PowerSolutions Live regional event series held each year around the globe. This will be CCRA’s first event focused on Corporate Travel Agencies and Suppliers. CCRA announced today the launch of a brand new event focused on the needs of corporate travel agencies. 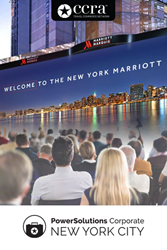 The one-day event will be held at the Marriott Marquis in New York City on October 23, 2018 and will feature several prominent keynote speakers, panels focused on relevant industry issues, a supplier roundtable series and a supplier pavilion with participants from the air, hotel, car, tech and business service segments of the travel industry. Panels will focus on VIP service for elite clientele, travel tech and capturing more business through the emergence of "bleisure travel". CCRA will also spend time educating customers on their Global Preferred Hotel Program and AirSelect consortium offerings, as well as their industry-leading 24/7 call center for agencies looking to improve their after hours and overflow call handling. Currently, CCRA has more than 500 corporate travel agencies who are engaged with their products and services on a daily basis, representing an exponentially larger number of points of sale booking hotel, air, cars and more through their products. Registration for the event is open, with a ticket fee of $99 per agent, which includes a full day of sessions, including breakfast, lunch and reception. Interested agents should visit https://www.ccra.com/pscorporate for more information and to register for the event.